First a fall log-in to your Facebook account. On the left side of your screen you can find “apps” option. Click on “apps” and then select “Events”. Now a new screen is popped out showing the upcoming events and birthdays. Now copy the birthday link address by right clicking on the birthday URL present on the right side of the screen. Now access your google calendar. On the left side of the screen you can see an option called “other calendar”. Click on the drop down arrow beside this option and then select “add by URL” option. A new pop-up screen is displayed. Paste the URL link in the URL place provided and then click on “add calendar”. Now all the birthdays of your friend’s will be transferred from Facebook to Google calendar. 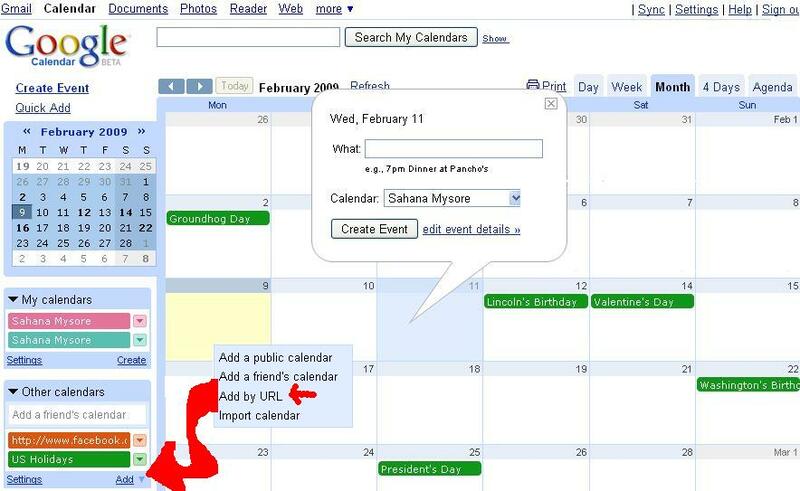 This is the best way to transfer Facebook Friend’s Birthdays to Google Calendar. Click on the drop down arrow of the imported calendar and select calendar settings. Enter your mobile number under the “reminder and notifications” section. You can even select the time when you want to receive the notification and also you can delete some of the unnecessary birthdays to avoid any unnecessary notifications. Now click on “OK” once you are done with all the necessary changes. That’s it. All the birthday of your friend’s are imported from Facebook to your Google calendar and you can wish all your friend’s without missing anyone of them. Get all important notifications on your mobile phone. Just transfer all your important reminders and almost everything. Get a text message on your mobile phone directly. Easily sync Facebook friends birthday, events to google calendar.